Who was George Washington Loomis? 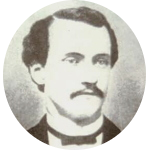 Wash Loomis was the leader of the notorious Loomis Gang. The gang operated mostly in the Nine Mile Swamp area of Madison County, New York, throughout the early and mid-nineteenth century. They were known for theft, burglary, horse thieving, rustling, and counterfeiting. In 1865, a group of masked men raided the Loomis home and murdered Wash Loomis. It was said that the back of his head was smashed in and his face so disfigured that he was unrecognizable. Wash Loomis's U. S. Presidential kin include Ulysses S. Grant, Millard Fillmore, Grover Cleveland, and Gerald Ford. He has family connections to a number of famous historical people including painter John Trumbull, abolitionist John Brown, Mormon Church founder Joseph Smith, artist Norman Rockwell, aviation pioneers Orville and Wilbur Wright, and signers of the U. S. Declaration of Independence Oliver Wolcott and William Williams. Wash Loomis has a number of literary kin including Stephen Crane, Edgar Rice Burroughs, and Emily Dickinson. Celebrity kin include Humphrey Bogart, Richard Gere, Oliver Platt, Jodie Foster, Amy Grant, Ellen DeGeneres, and Donny & Marie Osmond.